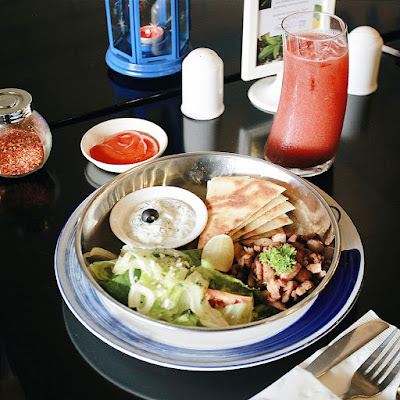 On my previous posts, I have shared with you about my culinary experiences on Lebanese food, American Grill BBQ, Japanese Deep fried skewers, many great Indonesian Local Food and restaurant hopping in several cities of Indonesia. Now I'm taking you to Southern Europe via this culinary experience at Gyros Alley. 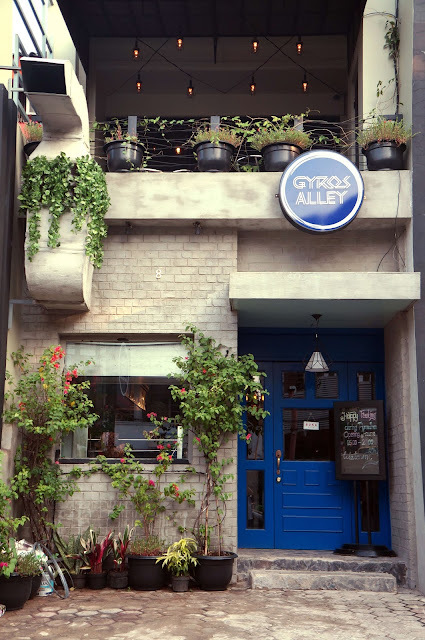 Gyros Alley's blue door had caught my attention previously when I was passing and it instantly reminded me of the famous blue and white Santorini's buildings (though actually I haven't visited Greece yet, LOL). 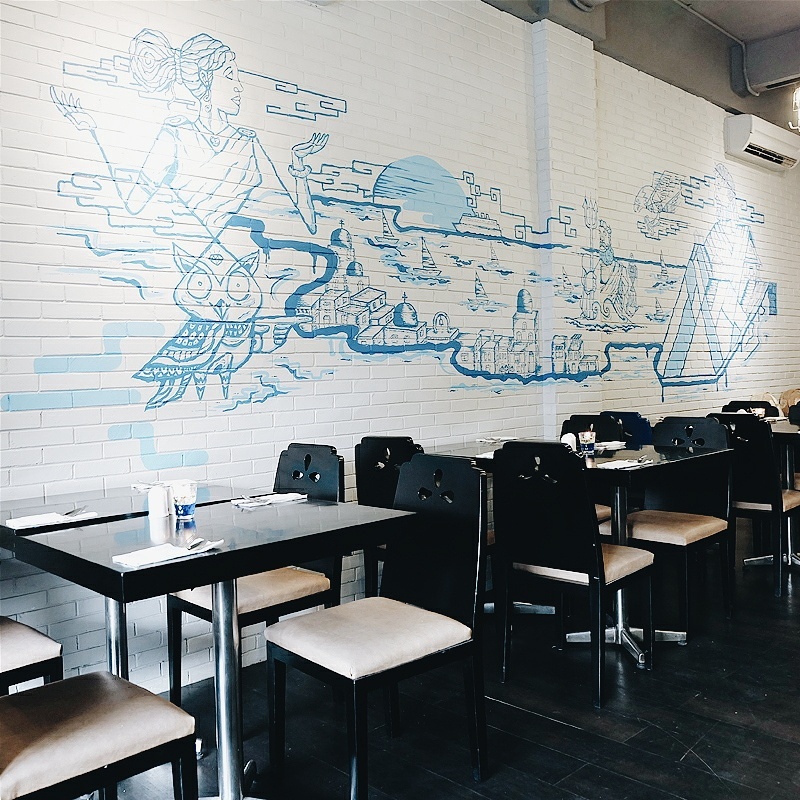 You can also find a piece of Greece inside the restaurant. My favorite was the mural on the lower level. It was my first time eating Greek food. Some of my friends said that Greek food has so much in common with Lebanese and Turkish food, from its Baklava, Falafel, Fatayer, Kebab and many more. Well, in Greek cuisine this "kebab" menu is called Gyro or Gyros, which is the main menu of this restaurant. Gyros Alley is located on Panglima Polim Area, South of Jakarta. 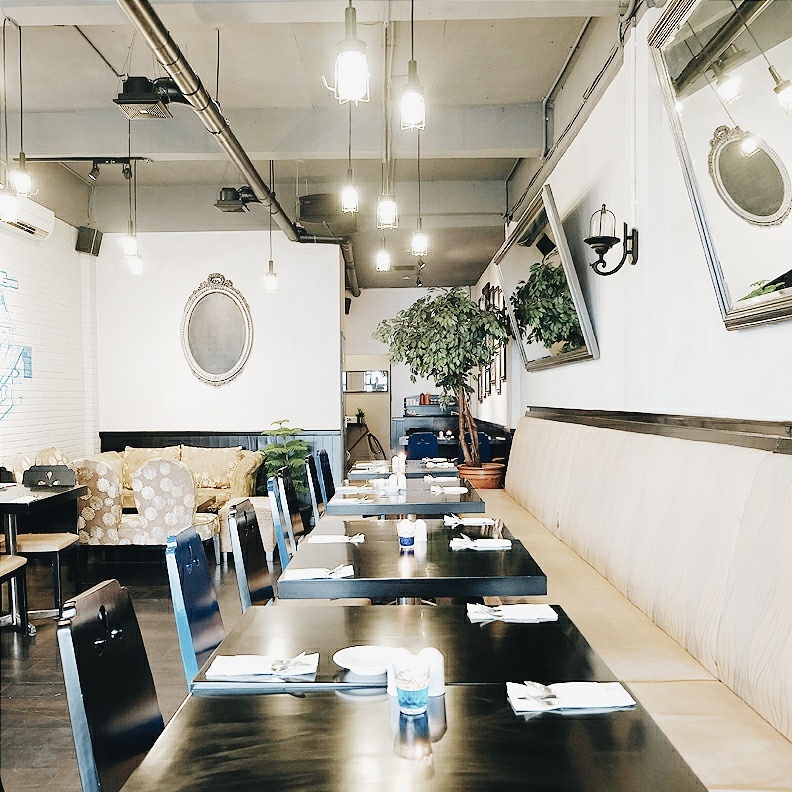 This area is known for its restaurants where young people hang out, from Mexican, Japanese, Korean, Spanish, Italian up to this new Greek restaurant. I came to Gyros Alley with my fellow bloggers to attend a travel blogger break-fasting event. 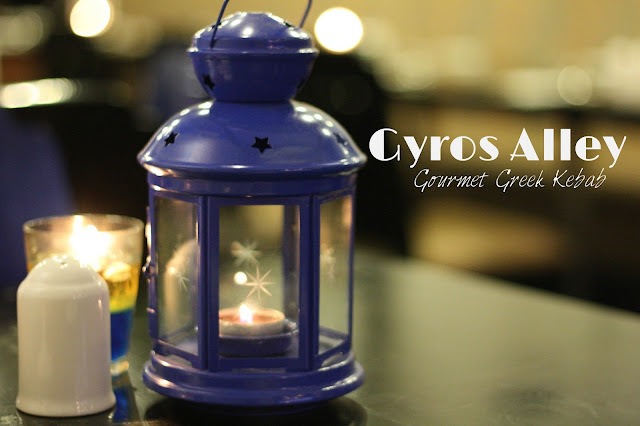 Let's try GREEK Food at Gyros Alley. As appetizer, I was tried Falafel, Calamari Rings and Spinakopita. Falafel is fritter balls of chickpeas and herbs, while Spinakopita is fried triangle-shaped pastry with spinach and feta cheese filling. 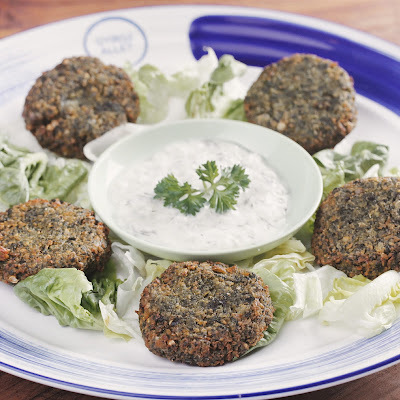 These appetizers were served with green mixed veggies and Tzaziki, dipping sauce made of yoghurt with cucumber and garlic puree (on Turkish cuisine it's called Cacik). For main course, I was tried their Beef Mousaka and Gyros Souvlaki Chicken. Greek Beef Mousaka is an oven-baked layer dish consists of ground meat & eggplant casserole with savory custard on top. 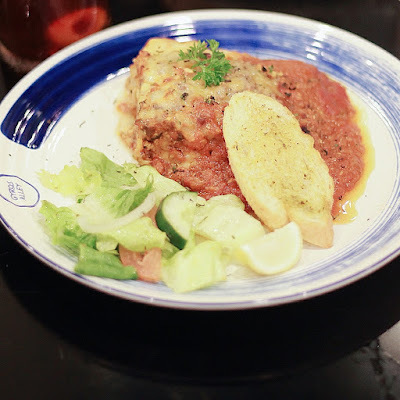 It has a similar taste with Lasagna and this one is my favorite. It's a little bit different with Beef Mousaka that I tried previously in Arabian Food. The Arabian Beef Mousaka did not have eggplant in it. 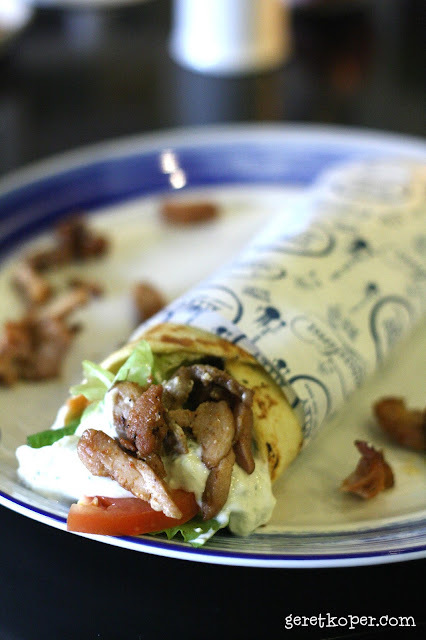 Gyros Chicken (kebab-like) is a charcoal roasted chicken with Tzaziki sauce, tomato and onion wrapped in Pita Bread. Gyros Alley serves 3 choice of Gyros; Lamb, Chicken and Vegetarian. For Lamb Gyros/Kebab, they use young lamb (I forgot how young specifically, will update on it soon) and grill it for hours. No wonder the meat was so tender. 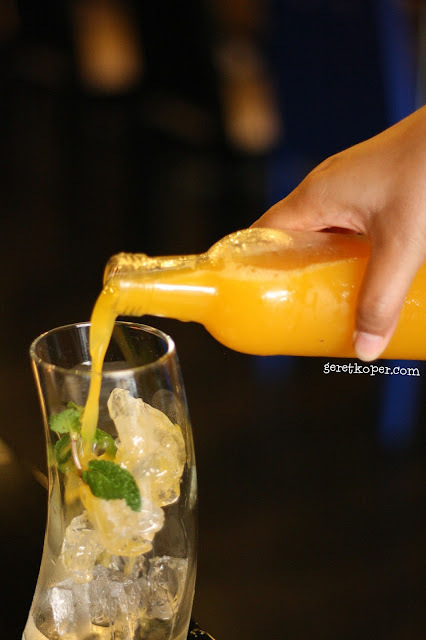 For the drink, I ordered Iced Lychee Tea and Gyros Alley's healthy juice in a bottle. I chose the Pure Orange one. You might want to try Gyros' other healthy juices with some unique names like Zeus Lightning Bolts (starfruit, orange, cucumber, pineapple), As The Story Goes (watermelon, mint, apple), Magical Green (green kale, pineapple, cucumber, pak choy) and Cassandra Potions (watermelon, strawberry, pineapple). Actually their special drinks are Lassi and Kombucha, unfortunately I haven't tried any of those. Lassi is a traditional yoghurt-based drink. 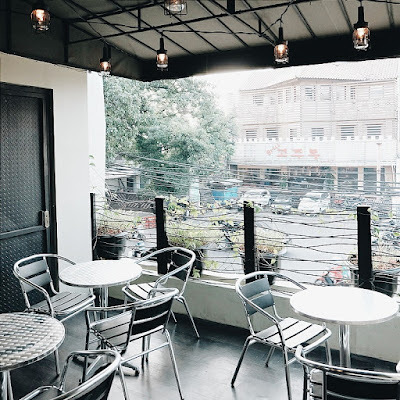 What makes Gyros Alley's Lassi special is that? it's made of Homemade Kefir, not the regular yoghurt. I can't wait for another visit to Gyros Alley to try these drinks. Tenpat nya nyaman banget, harga nya mahal ngak kak ???? fotonya bagus amaaaaat, kamu ke sini lagi yaaaa? Suasananya cozy dan makanannya tampak sangat enak, tempat yang bagus untuk mengisi perut sekaligus bersantai dengan sahabat, bagus sekali :hehe. 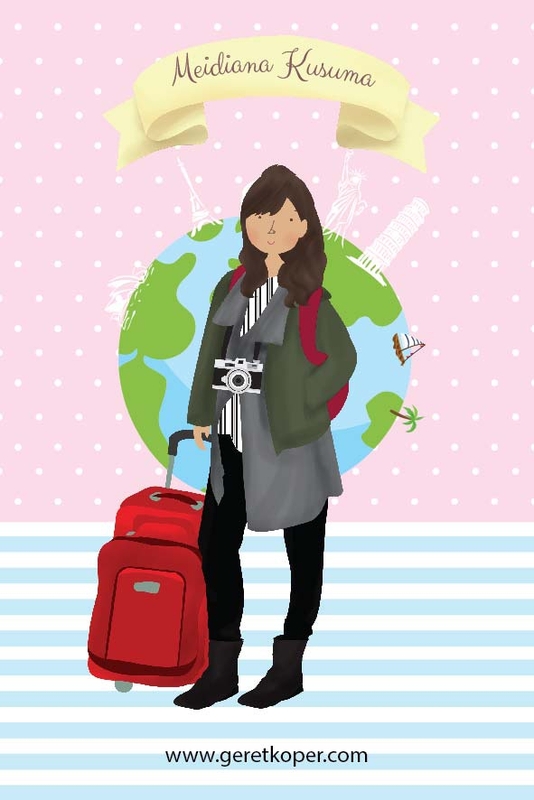 Jadi kepengin ke sana nih Mbak, kayaknya saya mengumpulkan massa dulu, kebetulan teman sudah ada yang berminat. Terima kasih buat rekomendasinya ya!